← The First Photos of Our Tiny House!!! My heirloom seeds have arrived! My seeds came in today!!! 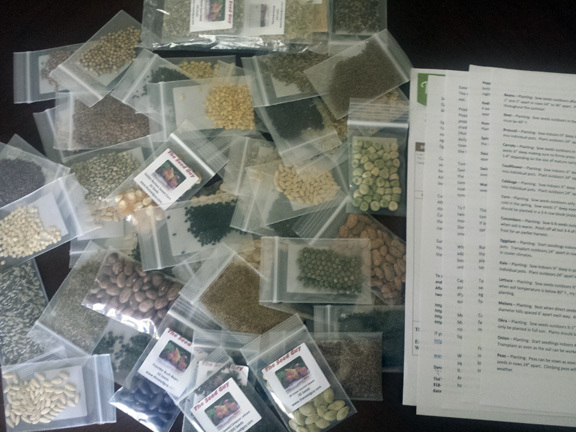 I ordered the 55 Variety Heirloom Non-GMO Seed Package from The Seed Guy, based out of Claremore, Oklahoma. What does heirloom mean, you ask? Heirloom plants are vegetables, flowers, and fruits grown from seeds that are passed down from generation to generation. They are open-pollinated, meaning they rely on natural pollination from insects or the wind. If stored properly, these seeds will last 4 years at room temperature, 5 – 7 years in the refrigerator, and 10 years in the freezer. So I will be able to use some now, and store the rest for our move to the off grid property! I plan to start small with our favorite veggies first, including tomatoes, green beans, broccoli, carrots and watermelon. My hubby doesn’t really like many vegetables (arrrrggghhh), and I think his health has suffered for it. I have slowly been pushing more and more on him. I don’t think he likes it. Luckily, the girls love their veggies. I made all of Hazy’s food myself with organic vegetables from our CSA, and I definitely think it helps to serve your baby yummy fresh veggies, rather than the stuff in the jar. I mean, who likes that stuff?!?! It is truly disgusting. You know you don’t want to eat those mashed up nasty peas in a jar, so why would you expect your baby to like them?! The raised beds are going directly behind my house, in the sunniest part of our half acre yard. I would love to put it down closer to the river, but there isn’t enough sun there. 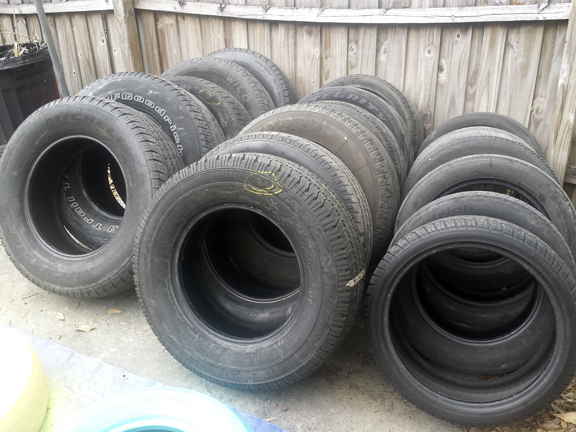 I plan to use these old tires as planters for some of my beds, like the tomatoes. Then I will build others from some leftover boards belonging to a previous occupant that I found in our old, collapsing shed. The only thing I will need to buy now is some good organic soil and compost. I started my own compost pile from our kitchen scraps and all the leaves from the oak trees in our yard, but it won’t be ready for quite some time. Herbs will go on the deck right outside my kitchen in containers. As I mentioned in a previous post, we had a garden when I was a kid…and I built and maintained a garden in college for my plant physiology classes, but with only a few species. I also had a small vegetable garden, just a couple species again, in my backyard in my 20s. But this will be my first “complete” garden. I can’t wait for my first harvest! !